The Aussie lifestyle revolves around spending time outside. As much time, effort and money is often invested in creating a private outdoor oasis as is spent decorating their family rooms. We recognise that choosing your outdoor furniture is a big decision. Ensuring value for money, quality, design, durability to the elements, and of course comfort is essential. Ensuring one ticks all these boxes can be tricky. At Daydream Leisure Furniture our aim is to make your decision making process easy. We understand the gruelling shopping around that people do, searching for their outdoor furniture, whether it’s online or in retail destinations. So we decided to break down the decision-making process and outline the key aspects you need to consider when making your selection. WHERE IS YOUR OUTDOOR FURNITURE GOING? Will your outdoor furniture be 100% exposed to the elements or do you have cover? Either way there are plenty of options available to you, but living in Australia we need to accept the harsh climate that we endure and be sensible in choosing furniture that will withstand the elements. There are certainly options that will outlast other choices in completely exposed environments. But if putting outdoor furniture in a covered outdoor area, don’t be fooled into thinking it will not suffer from the elements. Wind, moisture, salt air, humidity, wildlife, dirt, dust, and small amounts of light exposure definitely have adverse effects on furniture. You need outdoor furniture for outside. So remember if you have cover, it does not mean that you can settle for furniture that is not made for the outdoors. WHAT MATERIAL ARE YOU THINKING YOU WOULD LIKE YOUR OUTDOOR FURNITURE TO BE MADE OF? This is an important decision. Firstly it may be a decision that is influenced by your environment. Secondly it could be influenced by what loving furry friends you have that may also like to enjoy your outdoor furniture. Thirdly it may be a compromise between comfort and style. Lastly but not least you need to consider what it takes to maintain. 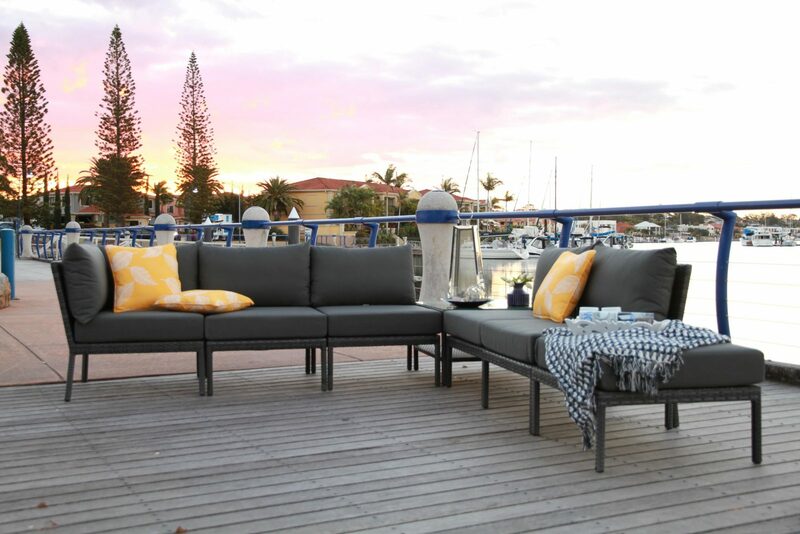 At Daydream Leisure Furniture you are spoilt for choice with such a wide variety of outdoor furniture options. Whatever material you choose, be it Kwila timber, Teak timber, Aluminium, Stainless steel, quality polypropylene/resin, outdoor wicker, concrete, or combinations of all of the above, we want to help you make the best decision. DO YOU WANT A DINING SETTING, COUCH SETTING, POOL FURNITURE, OCCASIONAL FURNITURE OR A COMBINATION OF THE ABOVE? Deciding how you want to sit, eat, relax, entertain and use your outdoor furniture is paramount. If you only want to dine then a table and chairs would be sensible. You may however decide you want to be able to dine, but also create a lounging feel outside. Some have room for both, but if you don’t have ample room, we have outdoor furniture options that can achieve these 2 scenarios all in one. We have found that many people are searching for ‘quiet corner’ furniture: furniture they turn to for quiet ‘me’ time. Daybeds are very popular, but sometimes a bar setting is what individuals are searching for. WHAT SIZE OUTDOOR FURNITURE DO YOU NEED? It has to fit. Take the time to measure your area, and take into consideration any hindering features to the area. You may have an annoying supporting post that is restricting your space. If so, consider this when deciding on size. Consider door entries, windows, view, outlook, what you want to achieve in the one area, how many people will be realistically utilising the furniture, the list goes on. WHAT COLOUR AND STYLE DO YOU WANT? This is a very personal decision. But don’t be afraid to ask for assistance. Our very experienced staff have some great ideas. For some this decision should be number one. Others are not concerned as long as they find what they want. At Daydream Leisure Furniture our aim is to provide value for money, quality furniture. Trust in us to help you create an outdoor furniture package that meets your budget. So there it is, answer all the above questions and together we can find outdoor furniture that you, your family and friends will enjoy many happy memories on. Check out some of the great options we have here or stop by our store on Nicklin Way in Warana today!